California Governor Jerry Brown today lauded the release of the “final” environmental documents for the controversial Delta Tunnels, a plan that fishermen, Tribal leaders, conservationists, family farmers and environmental justice advocates consider to be the most environmentally destructive public works project in California history. Brown also made his case for the tunnels in an article in the Sacramento Bee, “Jerry Brown plunges ahead on twin tunnels,” written by Dan Morain, the Bee's Opinion Page Editor. The decision to grant the permits for the Delta Tunnels won’t be made until next year after President-Elect Donald Trump enters office, so you can bet that Brown, in spite of his posing as the alleged "resistance" to Trump's environmental policies, will be doing everything he can to convince Trump to support his “legacy" project. “The Governor failed to remember the dangers for Delta residents associated with the project, from toxic algal blooms, to increased boron and selenium in drinking water, to greenhouse gas emissions equivalent to 600,000 new cars on the road each year from construction," she said. “This forgetting on Governor Brown's part is reckless and dangerous as he makes his appeal to President-elect Trump to support the project. Governor Brown is supporting a project that will leave Stockton, California, a majority-minority city, and other Delta environmental justice communities with degraded water -- all for the benefit of rich water exporters in the San Joaquin Valley, Southern California, and Silicon Valley,” she stated. “Shame on Governor Brown. What dishonest pandering,” Barrigan-Parrilla concluded. To read all of the environmental documents in the 90,000 page Environmental Impact Report/ Environmental Impact Statement (EIR/ EIS) for the Delta Tunnels, visit the Final Environmental Impact Report webpage. I'm constantly amazed how Jerry Brown constantly receives fawning coverage from the mainstream media when he appears at climate conferences in California and across the globe, even though his actual policies on fish, wildlife, water and the environment are among the most destructive of any governor in recent California history. Many mainstream reporters and editors have done very little research into the actual environmental policies of Jerry Brown, preferring to act as virtual stenographers and press release writers for the Governor. Although I have written about Brown’s environmental policies in many articles published in an array of media outlets, it’s a good idea to review them once again as this year nears its end. The Governor’s “legacy project,” the Delta Tunnels/California Water Fix, undoubtedly poses a huge threat to the ecosystems of the Sacramento, San Joaquin, Klamath and Trinity river systems, in contrast to the Brown’s claim in Morain’s article that the tunnels, combined with “Delta restoration,” ”could help native fish rebound from the edge of extinction. The project is based on the untenable premise that taking more water out of a river before it reaches the estuary will somehow “restore” the San Francisco Bay Delta and its precious fish and wildlife species. Unfortunately, the California WaterFix is not the only environmentally devastating policy promoted by Governor Jerry Brown. Brown is promoting the expansion of fracking and extreme oil extraction methods in California and is overseeing water policies that are driving winter run-Chinook salmon, Delta and longfin smelt and other species closer and closer to extinction. As if those examples of Brown’s tainted environmental legacy weren’t bad enough, Brown has promoted carbon trading and REDD policies that pose an enormous threat to Indigenous Peoples around the globe; has done nothing to stop clearcutting of forests by Sierra-Pacific and other timber companies; presided over record water exports from the Delta in 2011; and oversaw massive fish kills of Sacramento splittail and other species in 2011. 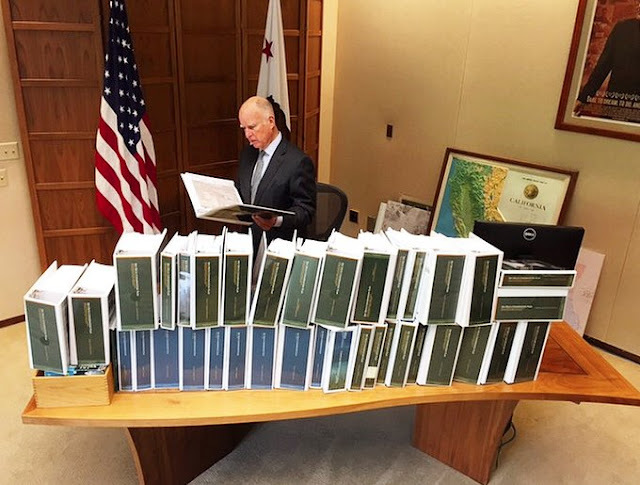 Jerry Brown also oversaw the “completion” of so-called “marine protected areas” under the privately funded Marine Life Protection Act (MLPA) Initiative, overseen by a Big Oil lobbyist and other corporate interests, in December 2012. These faux “Yosemites of the Sea” fail to protect the ocean from oil drilling, fracking, pollution, corporate aquaculture and all human impacts on the ocean other than sustainable fishing and gathering. Governor Brown’s anti-environmental policies, particularly his fervent support of fracking in spite of his cynical eco-babble about "green energy” and “defending science,” are the result of the millions of dollars that Brown has received from Big Oil, Big Ag and other corporate interests in recent years. The California Fair Political Practices Commission (FPPC) on September 23 opened an investigation into the California Democratic Party in response to a report by a prominent consumer group claiming that the party acted as a “laundry machine” to funnel donations from oil, energy and utility companies to Brown’s 2014 election campaign. Consumer Watchdog released the report, Brown’s Dirty Hands, on August 10, 2016, at a time when Brown faces increasing criticism from environmental, consumer and public interest groups regarding administration policies they say favor oil companies, energy companies and utilities over fish, water, people and the environment. The report tabulated donations totaling $9.8 million dollars to Jerry Brown’s campaigns, causes, and initiatives, and to the California Democratic Party since he ran for Governor from 26 energy companies with business before the state, according to Court. The companies included the state’s three major investor-owned utilities, as well as Occidental, Chevron, and NRG. The report alleges that energy companies donated $4.4 million to the Democratic Party, and the Democratic Party gave $4.7 million to Brown’s re-election between 2011 and 2014. Consumer Watchdog submitted its report to the FPPC as a sworn complaint. As this FPPC investigation proceeds, the big corporate money behind Governor Jerry Brown's controversial environmental policies is facing increasing scrutiny from public trust advocates. November 4 was the second anniversary of the passage of Proposition 1, Brown’s controversial water bond, a measure that fishing groups, California Indian Tribes, grassroots conservation groups and environmental justice advocates opposed because they considered it to be a water grab for corporate agribusiness and Big Money interests. Brown spouts “green” rhetoric when he flies off to climate conferences and issues proclamations about John Muir Day and Earth Day, but his actions and policies regarding fish, water and the environment should be challenged by all of those who care about the future of California and the West Coast.